Ever wondered just how your cars Air Conditioning actually works? 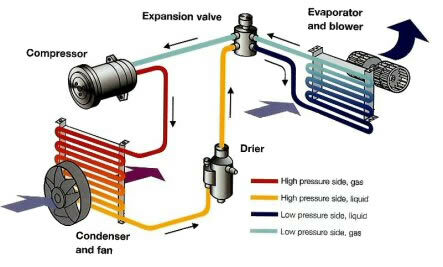 The Compressor transports the refrigerant at the required pressure through the air conditioning system. The refrigerant is a low pressure gas as it enters the Compressor from the Evaporator. The Compressor increases the refrigerant pressure and also its temperature so it becomes a high pressure gas which, in turn, helps the refrigerant condense more rapidly in the next component, which is the Condenser. The Compressor is mounted on the engine and is driven by a belt from the engine’s crankshaft pulley. The Condenser works in the opposite way to the Evaporator. The refrigerant gives up its heat generated by the Compressor by passing cold air across its fins and tubes by ram air or by an extra fan. The end result of this change is that the refrigerant is now a high pressure liquid and is forced out to the Receiver Drier through the liquid line. Depending on the type of air conditioning system fitted, this item can be called a Receiver Drier or an Accumulator. (The Accumulator is fitted on the low pressure gas line of an air conditioning system between the Compressor and the Evaporator and is used in conjunction with an orifice tube). The Receiver Drier is fitted on the high pressure liquid line of an air conditioning system between the Condenser and Expansion Device. The Receiver Drier has two parts to it, the receiver and, of course, the drier. The receiver section holds the right amount of refrigerant required by the system to ensure correct operation and to supply a steady flow of liquid refrigerant to the Expansion Device. The drier section is responsible for removing moisture from the air conditioning system by means of a bag of desiccant, which absorbs small quantities of moisture. The Expansion Device comes in many forms. It can be a brass internally or externally equalised valve, a block type valve or an orifice tube (the latter being part of an Accumulator type air conditioning system). Expansion Device’s have an inlet and an outlet which separates the high side of the system from the low side. A small restriction in the valve allows only a small amount of refrigerant to pass through it into the Evaporator, the amount of refrigerant passing through the valve depends on the Evaporator temperature. As soon as the liquid pressure drops, the refrigerant begins to boil (R134A refrigerant boils at approximately -26 degrees centigrade). As it continues to boil the Evaporator absorbs the heat passing over its tubes and fins and as a result the air is cooled. Remember that heat is being removed from the warm air and cold air is not being created. The compressor, on its suction side, removes the low pressure vapour from the Evaporator and the cycle starts all over again.